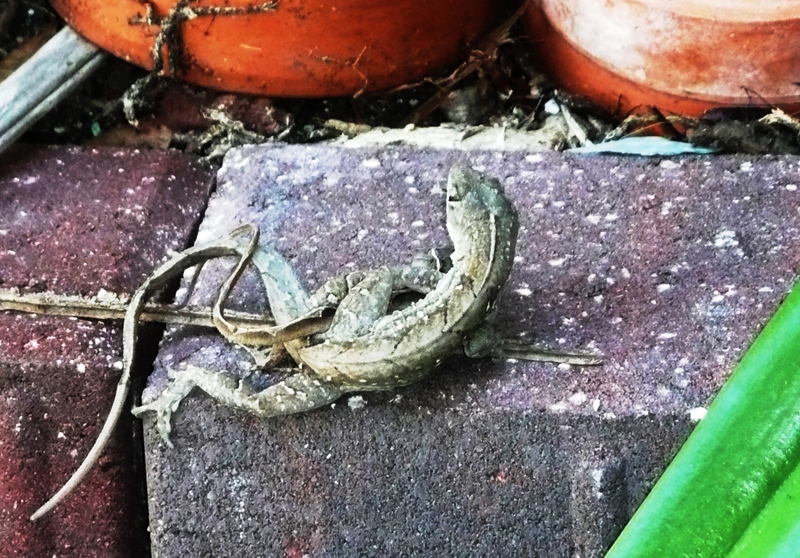 I’ve spent decades watching lizards. I’ve seen fights (sometimes to the death), celebrations, orgies, and babies. But I’ve never had a lizard friend until Lily. In the morning, she hops out to sit with me while I read the bad news of the day, jumping from my feet to my legs to snap mosquitoes and gnats. She lightning fast and nearly always gets her bug, although often, the bugs get me first. I swear she smiles when I greet her. I’d noticed him hanging around, flexing and bobbing his big body all over her territory. He’s at least twice her size and quite dark. When he fell on top of her yesterday, she barely resisted. Sometimes, a female will force a male to take the wildest of rides before submitting to the inevitable. But Lily collapsed under his weight and they lay together in a backwards C on the bricks. Every minute or so, one or the other engaged in frantic head-bobbing. After a particularly spirited bout on her part, the male reached around to clamp her jaws shut between his, their bodies doubly locked together. She stopped moving. But he was changing too. His dark color faded until his skin was exactly the same pale shade as hers. I wondered if this synchronicity was wanted or not. They were so still I dared look away and in that instant, it was over. Lily fled to the rim of an orchid pot, stories above where he languished on the pavement. He could barely walk, but that didn’t stop him from attempting some boastful push-ups. He got through about two-and-a-half before tottering off, weak and pleased with himself. Far above, Lily watched. She didn’t bob. He didn’t see her. And then, she leaped down and ran up my foot. There was a mosquito on my ankle and she was suddenly hungry.